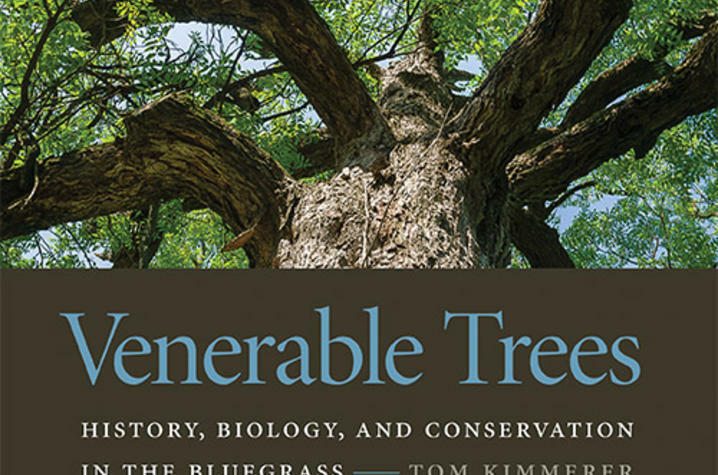 Author and former UK faculty member Tom Kimmerer talks about the venerable trees of Lexington with the Lexington Herald-Leader. LEXINGTON, Ky. (March 21, 2016) — With the passing of the first day of spring yesterday, many Kentuckians will start taking advantage of warm weather as they stroll down campus sidewalks, city streets or explore the many parks around the Bluegrass. While residents find themselves outside enjoying pleasant spring weather they may also find themselves admiring the Kentucky landscape that is dotted by trees that predate the settlement of the American colonies. Living examples of species such as bur oak, Shumard oak, kingnut and blue ash, among others, took root in the Bluegrass and Nashville Basin regions before Columbus ever crossed the Atlantic. In “Venerable Trees: History, Biology, and Conservation in the Bluegrass,” a new book from University Press of Kentucky (UPK), former University of Kentucky faculty member Tom Kimmerer showcases the beauty, age, size and splendor of these ancient trees, and the remaining woodland pastures they inhabit. Documenting the distinctive settlement history that allowed for their preservation, Kimmerer explains the biology of Bluegrass trees and explores the reasons why they are now in danger. He also reveals the dedication and creativity of those fighting to conserve these remarkable 300- to 500-year-old plants — from innovative, conscientious developers who build around them rather than clearing the land to farmers who use lightning rods to protect them from natural disasters. Featuring more than 100 color photographs, this beautifully illustrated book offers guidelines for conserving ancient trees worldwide while educating readers about their life cycle. “Venerable Trees” is an informative call to understand the challenges faced by the companions so deeply rooted in the region’s heritage and a passionate plea for their preservation. Currently, Kimmerer is chief scientist at Venerable Trees Inc., a nonprofit dedicated to the conservation of woodland pastures and ancient trees in the Bluegrass. Trained as a tree physiologist and forest scientist, he has been a researcher and teacher in the United States, Indonesia and Malaysia.